Does anyone want higher res versions of the amazing Awakening the Nightmare concept paintings from this morning's blog post? Of course you do! I've been rocking "Unending" as my wallpaper at work for a bit now and boy is it badass. I love these the art guys are on point. These are absolutely beautiful. Thanks Ske7ch! I'm all about this stuff. Thanks so much! CAN WE GET THESE IMAGES ON TSHIRTS??? Looks great, thanks for showing them. whats ATNS official release date? Wow, I love that y'all are continually making this game better! If you add map two more Blitz maps and a few more in multiplayer I'd happily play this game for another year or two after you finish updating it, can't wait for ATN, it's gonna be lit! What about an HD for some of the Blitz cards? 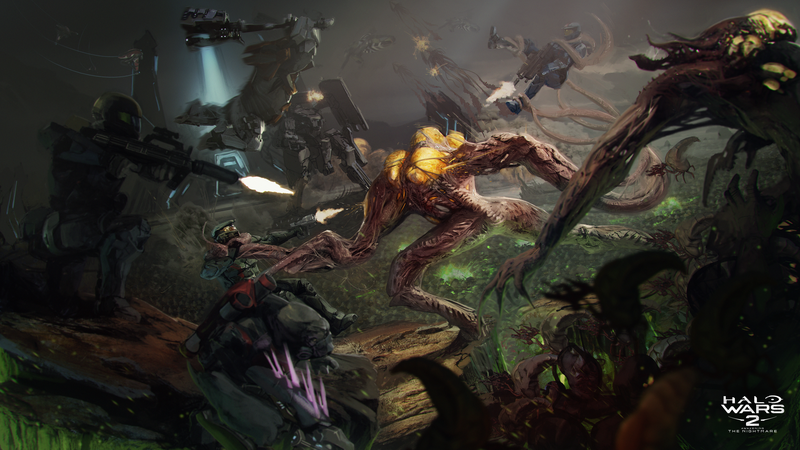 you should release an art book for Halo Wars 2. These are beautiful, but are not enough. Based on the second concept art, does this mean both sides will work together against the flood ? That's some awesome art work.